A chicken egg is a true pantry, which stores vitamins, balanced fats, micro and macro, lecithin, lysozyme, choline and arachidonic acid. However, the greatest value of eggs are considered to be proteins with selected amino acid composition, which are present both in the yolk and the protein – only in different proportions. 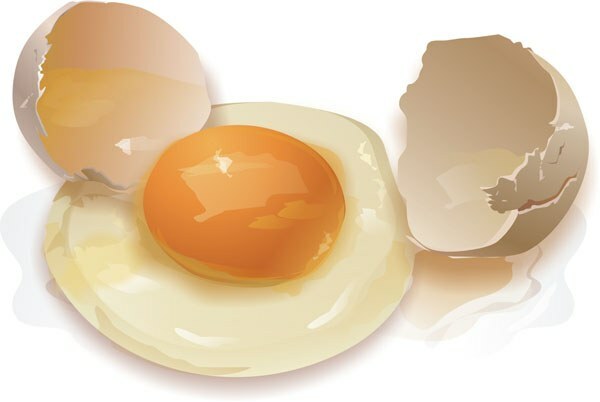 100 g of egg protein is of 11.1 g of protein, while 100 grams of yolk, their content exceeds 16 g. Thus, egg yolk full of complete proteins, which allows for a 7% to meet the daily needs of the organism in the protein. Due to the heat treatment, the egg is better absorbed than in raw and boiled egg white does not leave toxins in the intestine and is absorbed almost 98%. Crude protein more effectively reduces the acidity of gastric juice, but absorption of it is much heavier. For easy assimilation of protein, it is recommended to cook eggs soft-boiled or blend/mix with sugar. The average chicken egg contains 6 grams of high quality protein as animal protein and in the protein, and the yolk layer. To get the maximum amount of, do not skimp on the size and grade of purchased eggs, and if possible it is desirable also to pay attention to the breed and age of laying hens. To cover a single portion of protein you need to eat about 10 boiled egg whites or 2-3 egg yolks that are not seasoned. This will provide muscle tissues of the body with the necessary amount of construction material. Not to eat chicken eggs without anything, you can cook delicious and healthy cocktails that will cover the body's need for protein. So, to make one of these protein powders you need to mix in a blender 5 egg whites, 1 teaspoon of honey, 250 g of milk three peeled and walnut. Experienced athletes recommend to use for protein shakes is not chicken and quail eggs in which no Salmonella. Cocktail whisk to obtain a homogeneous structure and is drunk chilled. You can also use the whole egg – white and yolk. To prepare your protein milkshake, you need to take 500 g of fat-free chilled milk, a few bananas, 2 raw protein and 1 teaspoon cane sugar or honey. All the ingredients are whipped in a mixer, after which the cocktail can be consumed instead of Breakfast. To make nutritional protein mix, you finely chop 2 banana, add 3 fat-free yogurt, a half can of condensed milk and 2 raw protein chicken or quail eggs. All components are thoroughly mixed and put in the fridge, after which the mixture is consumed 150-200 g after 30 minutes after a meal.